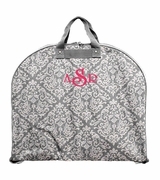 Personalized cosmetic bags for the bridal party. Cosmetic bag organizer is a waffle pattern with lined nylon interior and one wall pocket. Just the right size for cosmetics or bath accessories. Great thank you gift for wedding attendant presents. Personalized cosmetic bag measures 9"W x 6"H x 3.5 across bottom. Zipper closure.